Estrogen receptor (ER)-positive and human epidermal growth factor receptor 2 (HER2)-negetive breast cancers can be divided into luminal A and luminal B subtypes based on Ki67 expression levels. However, the biological differences in ER and progesterone receptor (PR) expression levels between these luminal subtypes are not clear. We examined immunohistochemical expression levels of ER, PR, and Ki67 in 180 ER-positive/HER2-negative breast cancers while taking menopausal status into account. 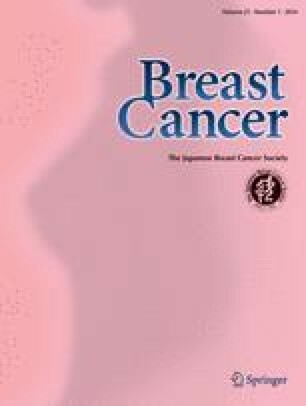 Breast cancers were divided according to ER and PR levels (H: >50%, L: ≤50%), and luminal A and B were classified by the Ki67 labeling index (A: Ki67 <14%, B: Ki67 ≥14%). When breast cancers were classified based on ER and PR levels, the distribution of pre- and postmenopausals was significantly different for luminal A (P < 0.0001), but not for luminal B cancers. As for luminal A, ER-H/PR-L cancers were rare among premenopausals (8%), but frequent among postmenopausals (54%). Correlation between ER and PR levels among luminal A cancers was strong in premenopausals but weak in postmenopausals. Since crosstalk with growth factor signaling is unlikely in luminal A, we speculate that intratumoral estrogen insufficiency contributed to the characteristics of postmenopausal ER-H/PR-L cancers. We speculate that the biological characteristics of luminal A cancers are influenced by the estrogen environment, but its influence on luminal B cancers may be limited. We believe these considerations constitute useful information for a better understanding of the biology of ER-positive-HER2-negetive breast cancers. Officers or advisers of companies or for-profit organizations: Dr. Toyomasa Katagiri (Memeber of the Board of Oncotherapy Science Co., Ltd). Honoraria paid by companies or for-profit organization as compensation for time or labor of researcher engaged for conference attendance: Dr. Yasuo Miyoshi (Astrazeneca K.K., Taiho Pharmaceutical Co., Ltd, Novartis K.K. ).